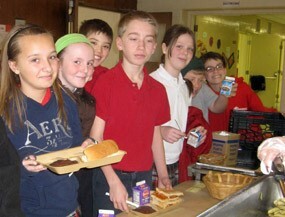 The hot lunch program begins on the first day of school. Ticket sales will begin immediately. If you wish for your child to participate in the Hot Lunch Program, please place a check or cash in an envelope with your child's name and grade on the front. Also, please state on the envelope if it is a 10-day, 20-day, or a milk ticket. Cash will not be accepted to purchase daily lunches. Students must have a lunch ticket to purchase a lunch. Milk will be available for exact change (50¢) or with a milk ticket. Please make checks payable to: "St. Brendan School Food Service." Your child's teacher will hold the ticket until lunch, at which time they will be distributed to the students. The server will mark the ticket after lunch and return it to the teacher for use the following day. There are no dates on the ticket, so your child may use the ticket on any day he or she chooses. If your child had a lunch ticket left from last school year, it will be passed along to the student's current classroom teacher.